21-Dec 2018 - Merry Christmas and a very Happy New Year to everyone - The League would like to wish all players, officials, referees, sponsors and supporters the very best for a wonderful Christmas and a very Happy and Prosperous New Year. 16 DEC - SUNDAY SENIOR CUP - It's no Joke for Village and Terminus is the end for Woodseats - The league had two representatives in the Senior Cup but unfortunately both sides exited at the quarter final stage. 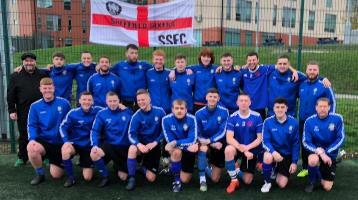 Current CBC Premier champions Stannington Village had a tough ask when they faced a trip current Senior Cup holders Joker of the Rotherham Sunday League. Fielding a bare eleven, Stannington competed well but were two goals adrift after an hour. However, Village pulled one back when Lewis Dickinson’s cross headed on by Bill Green to Dean Jepson who placed his header beyond the Joker goalkeeper. Moments later, Village were level. Dickinson again with the delivery and this time Lee Johnstone volleyed it home. The tie went to extra time and Joker grabbed the eventual winner midway through the second period of it. Try as they might, Village couldn’t level again but could be proud of their efforts with a great battling performance and Callum Lee was outstanding in Stannington’s goal. Woodseats Club were also in the quarter finals, but they also went out after a 2-0 loss at Terminus Tavern. Club had their chances to win in the game, but it was their wastefulness in front of goal which ultimately proved to be their downfall. After being on the defensive for much of the game, Tavern landed the ultimate sucker punch with two goals in the closing stages which put them in the semi finals and leave Club feeling crestfallen. 16 DEC - SUNDAY JUNIOR CUP - Crookes and Southey go through, but Earl commit a Schoolboy error - We have two representatives in the final four of the Sunday Junior Cup as first of all Southey Social defeated Cawthorne 3-2 after extra time. A superb through ball by Todd Guest set up Carlton Carty to round the home keeper for the game’s opening game before Cawthorne got back on parity. A close range finish from Joe Wallace restored Southey’s advantage but the home side responded almost immediately; all the goals in the first half. No goals followed in the second half and so it went to the extra thirty. Southey dominated that period and were rewarded when Ryan Damms, who had been unlucky in the second half, spun and fired home the match winning goal. Also making the final four are Southey’s First Division rivals Crookes FC as they demolished Wombwell Main Youth 5-0 in Barnsley. Matt Cowen (1st left) was the damage controller in chief as he bagged a hat-trick against the home side whilst a double from Liam Cartledge (2nd left) ensured that Crookes would go nap and secure their final four spot. Junior Cup holders Royal Earl were in the last eight of the Junior Cup, but they won’t be defending their crown this season as they crashed out to Doncaster based AFC Schoolboy by 3-1. Schoolboy were two goals to the good when Earl were given a chance to reduce the arrears but the normally prolific Steve Brammer failed from the penalty spot. Earl were awarded a second chance from twelve yards later and this time Tom Nolan made no mistake. Despite pushing for a leveller, Earl couldn’t get back on terms and Schoolboy secured their win with a third goal in the final minute. 16 DEC - CBC PREMIER - Redmires gp top, but Pheasant are hot on their heels - With CBC Premier leaders Oughtibridge not in action, Dave Hudson’s team were hoping for a result to go their way in the Intake Old Boys and Redmires encounter. However, they won’t spend the festive period on top as Redmires moved there after a 4-3 thriller. Redmires passing game was the main difference in the first half which saw Tom Whiting (right) notch a brace and then Danny Reet add the third. Intake improved much in the second half and reduced the margin when Darren Robinson fired home after Mark West set him up before Jack Heald netted the first of his two penalties after handball. George Rudd made it 2-4 after a fast Redmires break yet Heald kept his team in the game with a second penalty; again given for handball. Intake pushed for an equaliser but Redmires defence held sway to take the points. Moving into contention again are Wadsley Bridge Pheasant as they came from behind twice to defeat Wickersley 5-2 at Herringthorpe Stadium. After a goalless first half which the home side dominated, Wickersley eventually took the lead through Jack Whittaker before Joe Slater’s first penalty levelled matters. The home team regained their lead thanks to Joe McGuinness and then came the turning point when Jordan Thomas shot wide when he should have scored for 3-1. Lewis Fothergill then hauled Pheasant level before Slater put them ahead with his second penalty of the morning. Adam Askwith added number four before a great individual effort from Jordan Livett finished off Wickersley. 16 DEC - DIVISION 1 - Goals galore at the Ranch again, and by Forum as they go eleven points clear - Forum produced a scintillating second half to extend their lead at the top of Division One to eleven points when they defeated bottom placed Mosborough Reds 9-0. Gavin Dawson had given them a first half lead but the leaders really stepped it up in the second, scoring eight goals without response. Antony Holmes netted a hat-trick, Josh Gibson added a brace whilst Dawson with his second of the game plus strikes from Josh Schofield and Callum Mawbey completed the rout. Norton Oaks B retained the bragging rights in the Oaks derby, winning 4-2. It was the B team who took the early advantage when Nathan Davies produced a wondrous effort that even David Beckham would be proud of; scoring from the halfway line and straight into the top corner. However Oaks A levelled when Martyn Lee netted his first of the game from a Scott Westney through ball to ensure the teams went in all square at half time. Lee put Oaks A ahead but Will Carlisle equalised almost straight away for the B. It was anyone’s derby after that and it would take either magic or tragedy to separate them; alas for Oaks A it was the latter when Ben Birtles headed into his own net after a defensive misunderstanding and then Jack Peake secured the B team double with a fourth as the Oaks A pushed forward for parity. We had goals galore at Ranch again as this time a 5-5 draw with Civil Sports A; just seven days after a 7-6 thriller with Southey Social. Chris Wajs gave Ranch the lead but by time it was half time Civil had stormed into a 5-1 lead thanks to a brace each from Dan Cain and Thomas Bamford plus one from Tapiwanashe Nyasvimbo. The home side rallied in the second half but were struggling to get by the Civil custodian until Matt Jacobs then produced a perfect hat-trick to haul Ranch within one goal and the comeback was complete when Jack Jones scored from the penalty spot. Civil were on the back foot from thereafter but held on for a draw in another hugely entertaining game at Ranch which can’t be good for any manager’s heart rate. 16 DEC - DIVISION 2 - Mosborough hit by leaders Sixs and Boundary also win - Sheffield Sixs (left) recovered from the loss of their unbeaten record to Woodseats Chantrey when they saw off near challengers Mosborough Whites 4-1 in Division Two. Former Wadsley Bridge Pheasant striker Danny Barnsley opened the scoring in the eighteenth minute when he latched onto an excellent through ball from Brad Howe to net. The Davies brothers scored in the second half to put Sixs three goals ahead, Tommy scoring the second of the game and then turning provider for Liam for number three. Jack Bennett pulled one back for Whites he netted the rebound after seeing his initial penalty saved before Barnsley finished the game off with his second and Sixs’ fourth after seventy-three minutes. Into second place are Boynton Sports as they recorded a 3-1 home win over Woodseats Chantrey. All the goals came in the first half with the prolific duo of Jake Ballinger, with two, and Marcus Gordon on target for the home side. Chantrey had reduced the arrears to 2-1 midway through that opening half when Luke Glaves saw his scuffed shot land into the feet of Luke Simmonds who finished into the bottom corner but they couldn’t find anything more to spring a second surprise in as many weeks. Cadbury’s slide down the table continues with a 4-3 loss at Brinsworth Phoenix; although they are only three points off the third promotion slot. Daniel Commander opened the scoring for Phoenix when he finished neatly from a Ryan Fisher pass and then great wing play from Cameron Whyatt set up Karl Fox for the second. Cadbury replied back with two of their own before Whyatt netted after Commander and Brad Beadham had created the chance for Phoenix’s third, a third Cadbury strike followed before Commander got onto the end of a long ball to defy two Cadbury defenders and strike the winner. Hitting the sweet spot for Cadbury though were James Waite with a double and one from Richard Hales. 11 DEC - Fixtures and Referees for JANUARY 2019 now added - The Fixtures and Referees for JANUARY 2019 have now been added to the website. Home clubs should contact their opponents and Referees where shown ASAP. 9 DEC - CBC PREMIER - Bryan makes life hard for Redmires - With CBC Premier leaders Oughtibridge WM not in action, any of three sides could have leapfrogged David Hudson’s team to ascend to the top but neither of them managed to do so in one of the most open CBC Premier Division races so far. With the weather taking out Norton Sportsman’s home game against Stannington Village, Redmires slipped up when crashing to a 3-0 loss at Woodseats Club. A superb volley from Nick Owen gave the home side a lead after just ten minutes play and that was doubled after twenty with Liam Bryan (right) on target. Five minutes from half time, Bryan scored his second of the game and despite a tight second half; Club held sway for three massive points. Moving up to third in the table are Wadsley Bridge Pheasant as they overcame a tough task at Handsworth Old Crown with a 3-1 away win. Handsworth led at the break when Ben Shackshaft got his head onto a Jordan Stocks cross, but the visitors were back on parity when Adam Askwith was the man on the spot to level. Dylan Parrott (left) was introduced as a substitute for Pheasant and it was his through ball that led to Joel Evans volleying home past the Handsworth keeper. Parrott wasn’t done then as he sealed the win with a superb curling effort that found the top corner of the net. Intake Old Boys continued their revival with a superb 6-1 win at a Chapeltown RBL side now seven from the safety margin. Mark West led the hit parade with a brace, whilst Josh Barringham, Jamie Roper, Jack Heald and Elliot Coles all found the back of the Legion net. Legion competed as well as they have done all season and netted through Ben Wright who headed home a Danny Cardwell free-kick but despite also striking the foot of the post, slipped to their eighth loss in ten league games. 9 DEC - DIVISION 1 - Forum go 8 points clear in a flood of goals - After losing their Division One unbeaten record a fortnight ago, Forum got back to winning ways with a 4-2 success at home to Cobden View. Cobden took the lead when Ben Bell capitalised on a Forum mistake but the home side were 2-1 ahead at the interval thanks to goals from Nat Reid and Antony Holmes (right). Substitute Will Cutler drew Cobden level with a low drive but Joseph Thompson restored the lead for Forum almost immediately and Matty Ord secured the points with Forum’s fourth of the game. Cotts saw their big home game against Royal Earl succumb to a waterlogged pitch, and this inactivity allowed Crookes FC to rise to third on goal difference after racking up an 11-1 win at bottom placed Mosborough Reds. Matt Cowen (left) went nap for the visitors to lead their scorechart whilst Liam Cartledge added a hat-trick of his own. Andy and Phil Parkin both netted single strikes as did Mike Murphy as away side went goal crazy against a Reds side whose strike came from Josh Smith with a well-controlled turn and shot six minutes from half time. In the Norton Oaks derby, the B side produced a superb comeback with three goals in the final ten minutes to win by the odd goal in seven. Will Carlisle gave the B team an early lead but a brace from Martin Lee and one from Scott Westney put the A side into a 3-1 lead at the half time interval. That lead stayed intact until Carlisle scored twice in the closing stages, one with his weaker foot, to level matters and complete a superb treble. Buoyed by this comeback, Oaks B continued to press and were rewarded with a winner when an Oaks A defender turned a Nathan Davies cross into his own net with just two minutes left to play. If you wanted goals though, you had to be at Ranch versus Southey Social as the two sides traded thirteen goals with Ranch edging it. Jack Williams (right) bagged a hat-trick for the hosts who came from behind three times with Alex Mosley, Mikey Vella and Harley Wilson also on target. Southey were propelled by five goals from John Mellor, three of which came from the penalty spot and one from Ryan Damms but it was Mitch Cowlishaw who struck a brilliant left foot winner from the edge of the area with fifteen minutes left. A classic game that had everything and had neutrals purring. 9 DEC - DIVISION 2 - Chantrey hit the last unbeaten record for Six - The last unbeaten record left standing is no more as Sheffield Sixs slipped to a 2-1 loss at Woodseats Chantrey who produced their best performances of the season. Luke Simmonds gave Chantrey the lead when he volleyed in from range via the crossbar after twenty-one minutes and it was doubled when Spencer Russell tapped home from close range ten minutes from the interval. Liam Davies reduced the arrears almost immediately and despite Sixs piling the pressure and hitting the crossbar twice in the last five minutes, Chantrey produced a superb rear-guard action to record a superb win. Goals from Simon Marsden and Marcus Gordon (right) did the trick for Boynton Sports as they rode away with three points from their visit to Wadsley Horse and Jockey, whilst Beighton Magpies and Cadbury shook hands on a 1-1 draw in a game that was another one that was a credit to the league. Scott Bottom gave Cadbury the lead with ten minutes to go to half time and despite some dogged resistance from the visitors, Beighton levelled matters with quarter of hour to go through Joshua Butcher (left). The games between Civil Sports B and Mosborough Whites, and Woodhouse Juniors against Brinsworth Phoenix were postponed due to unplayable pitch surfaces. 2 DEC - TWENTYTWO CUP - It's shocks all the way as the Premier almost gets blown away - It was a surprising day in the Blades Super Draw League with shocks a plenty in the quarter final stage of the Twentytwo Cup, whilst the league programme saw all three divisions get that bit more interesting as we head towards the Christmas break. Few would have expected that there would be just one CBC Premier Division side standing after the quarter-finals, and one of those victims were last season’s winners Wadsley Bridge Pheasant as they exited 3-2 to visitors Crookes FC of Division One who are in their second semi-final in as many seasons. Peter Smith (right) gave Crookes a lead at half time but two goals from Andy Dawson and Craig Senior had Pheasant in front in a game affected by rain and a swirling wind. Smith’s second of the morning levelled matters and the game looked set for extra time until Liam Cartledge scored a dramatic winner for the away side with just minutes left on the clock. Another CBC Premier side that bit the dust were Redmires as Division One leaders Forum came away from their trip to Tapton School with a 3-2 success. Granted Redmires were not at full strength, Forum deserved their win with goals from Antony Holmes, Andy Harrison and Matty Ord whilst Tom Whiting and Matt Hanson hit the target for the hosts. A third CBC Premier side biting the dust to a lower side were Intake Old Boys as they succumbed 3-1 to Division Two side Boynton Sports. Boynton took the lead midway through the first half when Curtis Priday netted direct from a corner but Intake responded well when Mark West latched onto a through ball to level matters. Jake Ballinger put the home side ahead at the break with a classy finish and the same forward put his side 3-1 ahead when he connected with a Ben Jordan pass that split Intake open. Intake pushed on after that but found no luck as a Josh Jones inspired Boynton defence repelled everything the visitors tried. Even though it was a game between two top flight sides, it came as a surprise to some to see Stannington Village also exit at the quarter-final stage. Last season’s losing finalists Handsworth Old Crown were the team to succeed as they left Malin Bridge Gas Club with a 3-1 win. Luke Fletcher gave Old Crown the lead when he headed in from Tom Smith’s cross and the away side went close to adding when veteran Kieran Gallagher’s long range strike was saved spectacularly by the Village custodian. There was nothing the keeper could do to deny Liam Greenfield the second away goal early in the second half but a Lewis Dickinson penalty gave Village a lifeline. Stannington piled on the pressure after that and the Handsworth defence had to hold firm stoutly before Gallagher (left) netted a third for the away side after Fletcher had been brought down in the area. It could have been more convincing but Gallagher fired a second penalty over the bar once more after Fletcher had been upended. 2 DEC - CBC PREMIER - Chambers made to put Oughtibridge back on top and Sportsman up to third - There were only a couple of games in the CBC Premier and we have new leaders again as David Hudson’s Oughtibridge WM side got the better of Renishaw Rangers by the odd goal in five. A brilliant team move provided the game’s opening goal with Strachan Sampson the eventual beneficiary but James Savage levelled matters with a clinical finish from a tight angle. A superb curled effort from Jordan Smith restored the home lead and that was extended to 3-1 when Sampson played in Callum Chambers (right). Renishaw captain Lee Walker headed home his side’s second and Oughtibridge were indebted to keeper Chris Arnett who denied the prolific Robin Holmes from the penalty spot in the closing minutes and also saved the follow up for equal measure. 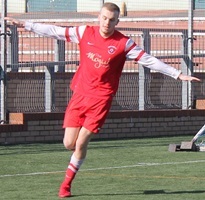 After suffering a couple of reverses recently Norton Sportsman got back on the winning trail as they made their trip to the Herringthorpe Stadium a success with a 4-1 win over hosts Wickersley Youth. It had been a goalless first half with chances at a premium but Sportsman took the lead when neat play between Jack Waymouth and Chris Winters saw the latter net from twenty yards. Kris Lee-Green equalised for the home team but it was the visitors who took the points with three goals in the final quarter of an hour thanks to strikes from Harry Mitchell, Brad Bowland and Michael Gibbons. 2 DEC - DIVISION 1 - Cotts win at Reds to close the gap at the top - With leaders Forum in Twentytwo Cup action, second placed Cotts reduced the gap to just five points and with a game in hand as they defeated bottom placed Mosborough Reds 3-1 away from home. Harry Shaw gave Cotts the lead but a superb curled effort from Jake Leonard levelled matters by half time. Two goals in twelve second half minutes secured the win though with Michael Blythen and Jon Dolan both hitting the back of the Reds net. Moving up to third are Royal Earl as a Steve Brammer (right) brace helped them to a 4-2 home win over Norton Oaks B. Jack Peake gave Oaks the lead but Billy Wright levelled for Earl before Brammer scored his first of the morning. Mark Turton headed Oaks back on parity but Brammer’s second ensured the home side would end the first half 3-2 up. Sam Smith scored Earl’s fourth early in the second half and despite Oaks giving it almost everything, the home side secured the points. Also rising up the table are Civil Sports B as they won 2-1 at Cobden View. Thomas Bamford headed in from a free-kick to give the visitors the lead but Aaron Ellis levelled matters with a shot from the edge of the box. A breakaway would prove decisive in the second half as the away side netted through James Brown to feel good and leapfrog their opponents and Southey Social into fifth. Whilst in the remaining Division One game, Norton Oaks A recovered from a 2-1 deficit to net six unanswered replies and defeat Ranch 7-2. Martin Lee led the scoresheet with four goals for Oaks whilst a John Rossiter brace and one from Jason Hopwood made up the seven whilst Ranch netted through Alex Mosley and Jay Lindsay. 2 DEC - DIVISION 2 - Sixs doubles for Nocholson and Elms sees them go top after Parker and Belshaw stun Whites - Sheffield Sixs made it seven wins from seven as they saw off Wadsley Horse and Jockey, 5-1. A towering header from Brad Nicholson gave them an early lead which was doubled by Joel Elms’ first of the game and then added to further when Danny Barnsley scored. Elms headed in his second and Sixs’ fourth of the game after thirty-two minutes to put the skids right under Jockey but a George Scott screamer reduced the deficit on the hour. However, Sixs completed a good morning’s work when Nicholson scored with a screamer of his own just a couple of minutes after Scott’s effort. Free-scoring Colley put a major dent in Mosborough Whites’ promotion hopes with a 7-4 home success which hoists them into third. Danny Parker (left) was the wrecker in chief for Colley as he bagged four into the Whites net whilst Chris Belshaw added a hat-trick of his own. Whites were second best throughout and replied with a hat-trick from top scorer Luke Walker and one from Levi Williamson. Another promotion bid which hit the buffers was Cadbury as Beighton Magpies flew to a 4-3 success. The home side only had themselves to blame as they squandered a 3-1 advantage given to them by a Richard Hales brace and one from Josh Grant. Will Simpson had scored Magpies opener but his side took flight and goals from Joshua Butcher, Sergiu Udrea and Stefan Hadfield completed a great comeback. Leon Cheslett hit a brace as Woodhouse Juniors romped to a superb 7-1 win at Brinsworth Phoenix, a result that puts the visitors in the thick of the promotion race. Tom and Joe Bland also scored a goal apiece to add to that Cheslett brace whilst Dan Lockwood, Alex Philpott and Harry Broadbent equally found the net with Joe Statham’s long range volley at 6-0 being just a mere consolation, Matt Cooper missed a penalty for Woodhouse as Phoenix were taken apart. In the final game Shakey shook hosts Civil Sports B in the basement battle with a 5-2 away triumph. Billy Hilbert and Jack Battle both hit doubles and Steve Dickinson added the other as the visitors went nap against a Civil side still looking for their first win of the season. Civil’s goals coming from Joe Taylor and Ben Firth.